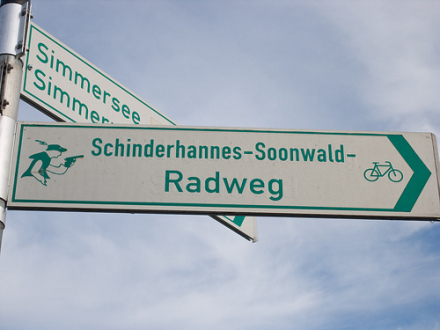 On this date in 1803, the famous German bandit “Schinderhannes” and 19 others of his gang were efficiently guillotined in French-occupied Rhineland. 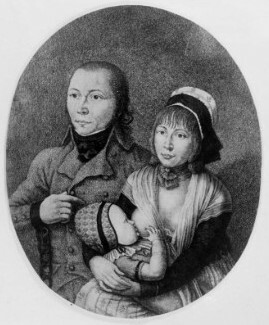 Schinderhannes with mistress Juliana Blasius and their child. As low-born as they come, Johannes Bückler (English Wikipedia link | German) hailed from a family of executioners and knackers (his appellation means “John the Knacker”). But this outcast was born to command, and in the wild Rhineland at the close of the 18th century, his audacity, charisma, and deft cruelty made him a legendary bandit king. He stole, he blackmailed, he slipped his fetters … “he seemed to contest French authority” recently projected by the revolutionary citizen-army, and he preyed heavily on unpopular Jewish merchants, all of which gave Bückler purchase on folk hero status with the boldness to hold a public “robber’s ball” at the ruined castle his band occupied. His legend grew in his own lifetime, and as such things do, it inflated quite past any capacity of its originator’s character to support. When things got too hot on the French side of the Rhine, he ducked over the frontier to the Holy Roman Empire in the east, but was nabbed attempting to lay low in the imperial army under an assumed name, and handed back to the French. The authorities turned his outlaw gallantry to good effect (or at least, that’s the cover story his apologists have made for his stool pigeoning) by threatening to come down on the mistress who bore him a child, leading Schinderhannes to get her off with a slap on the wrist by giving up his bandit brethren. And with French law came French execution technology, whose proliferation in the train of Napoleon’s Grande Armee would bequeath the German condemned death by the “falling axe” down to Hitler’s time and even after. 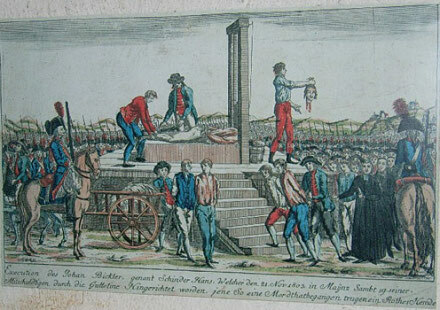 A spectacle here as it was in France, tens of thousands turned up in Mainz this date in 1803 for what sounds like an anticlimactic six-minute show of a score of Schinderhannes’ gang losing their heads to the mechanical contraption. The bandit-chief preserved his intrepidity to the last, and left to other times, unsullied by many of the basenesses of his tribe, the name of SCHINDERHANNES, THE ROBBER OF THE RHINE. … the outlaw has long outlived his guillotining, to the profit of the tourist trade in his former stomping-grounds.